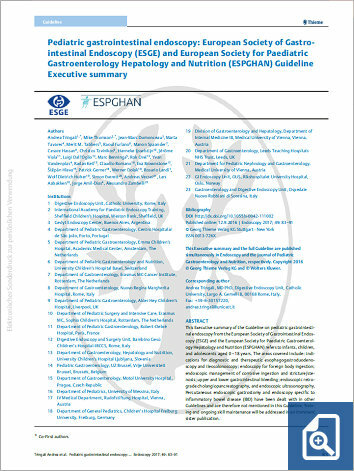 This Executive summary of the Guideline on pediatric gastrointestinal endoscopy from the European Society of Gastrointestinal Endoscopy (ESGE) and the European Society for Paediatric Gastroenterology Hepatology and Nutrition (ESPGHAN) refers to infants, children, and adolescents aged 0–18 years. The areas covered include: indications for diagnostic and therapeutic esophagogastroduodenoscopy and ileocolonoscopy; endoscopy for foreign body ingestion; endoscopic management of corrosive ingestion and stricture/ stenosis; upper and lower gastrointestinal bleeding; endoscopic retrograde cholangiopancreatography, and endoscopic ultrasonography. Percutaneous endoscopic gastrostomy and endoscopy specific to inflammatory bowel disease (IBD) have been dealt with in other Guidelines and are therefore not mentioned in this Guideline. Training and ongoing skill maintenance will be addressed in an imminent sister publication.